I picked up this set of Eagle embossed match safes in Nashville TN. The one on the left, has an eagle embossed on the front, while the one on the right has an Eagle on the front and back. Which is really rare. Ones like this are dug in winter camps a lot. 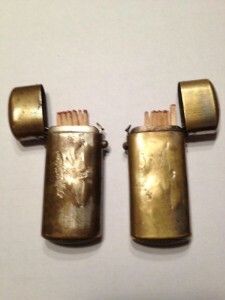 The matches on the inside of the safes, are Civil War period.